Chore is one of those unpopular words around here, even with the grownups. I don’t know that anyone really likes doing them, but one of the things we’re learning is that on a farm there are some chores that can be put off, and some that absolutely cannot. Around here the ones that cannot usually directly relate to caring for those who cannot care for themselves. Livestock chores are invariably stinky and messy, but they make up for it by the magic proximity of living things. 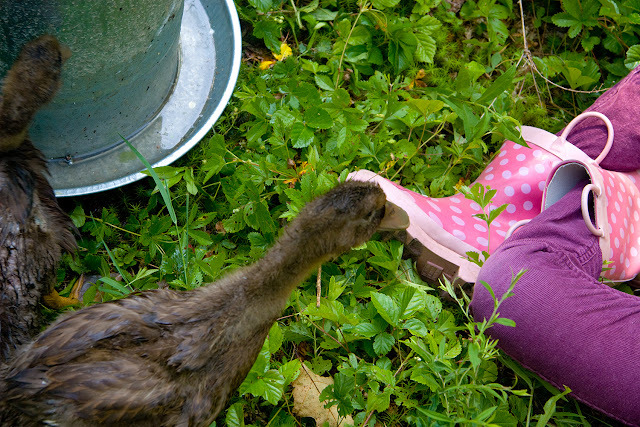 Quite frankly, there is no one in our family who cannot spend hours just watching our fowl do their thing. They are amazingly busy creatures. Every morning in good weather, the ducks are gathered up and put into an outside yard. The chicks (who are still small enough to escape the yard with alarming frequency) are then turned into the duck brooder to turn the night’s accumulation of wet shavings into the dry litter underneath, thus wasting less litter while at the same time allowing this lazy farmer to avoid one of the nastiest chores – stirring duck poop. Susan, who is all of seven, helps me with these chores. 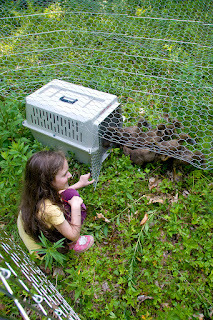 She helps me move the ducks into the yard, then climbs into the chicken brooder and gently moves each chicken into the adjacent duck brooder. She does an amazing job keeping the flock calm; she moves slowly and scoops them up from underneath. This creates very little fuss. She’s actually gotten to the point where she can do it completely unsupervised while I do the heavier chores of lifting, cleaning, and filling the feeders and waterers. I’ve taken to calling her our chicken whisperer. Now that it’s summer vacation she also spends at least an hour each day in the yard with the birds, socializing them. This is actually a very important job, as ducks lose their domestication in a matter of days if not exposed to people, and we’ve noticed that just moving them back and forth is not enough to keep them docile instead of terrified when people are around. During all of this work she is learning. She is learning about birds; how fragile they are, how much food they eat and water they drink, their habits and basic social behavior. She learns about their anatomy (“Wait, eggs come out of WHERE?”), and their biological history. Learning that chickens are dinosaurs was a pretty big hit with the under 5 foot tall crowd, all the way around. Truthfully, we grownups on the farm think it’s pretty cool too. But most of all she’s learning about herself. She’s learning that the animals need attention no less because she doesn’t feel like it, or doesn’t feel well. A skill I know will serve her well, especially should she decide on motherhood later on. Most important however, is that these animals are giving her the gift of her own silence, of her stillness. They give her a place within herself that is quiet, that she can use as a foundation for building the kind of person she wants to be. It is a place where she can listen to her own thoughts and dreams. Where she can learn to always be honest with herself. This gift, given by the birds, the trees, the wind, is one that I actively cultivate. “Go OUTSIDE.” I have learned was not just about my mother’s irritation, but was also about giving me the greatest of foundations; the Earth itself. I am continuing this tradition, and have been pleasantly surprised to watch a groaned, “Oh NOOOO!” turn into a perky, “Okay!” over the last few weeks. I watch from these huge windows as they build entire worlds, wage mock wars, or sometimes just sit and listen to the wind. It is an amazing thing to have that much room to run. And I have come to a conclusion. This is their work. This is the work of childhood, this foundation building. And what they are doing has nothing to do with tests or structure, playgroups or organized sports. 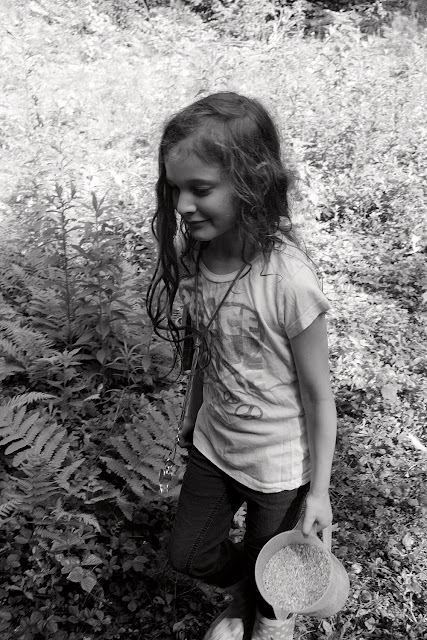 It has to do with the freedom to explore themselves and their world without a parent or other adult in sight. With the freedom to just be. They are not on display, though mind you, I can see them anywhere in the yard from the house. But they FEEL free. I do not disillusion them. I remember my own childhood, how that time out of the house was my solace, space and quiet enough to sit with my own thoughts. How, even now, the out of doors is my solace. And the backlash of all of this freedom? They are more responsible. And happier. Isn’t that just amazing? I sometimes wonder what that says about human nature and the direction of parenting in our culture. For the past 150 years or so we have moved away from the earth, and stuck our children into increasingly terrible public schools or increasingly expensive private ones. We as a culture have moved away from the home. First the men, then the women, and now the children. We have moved ourselves away from our hearths, away from our hearts, for what? Security? Doesn’t seem like that one’s working out. How about happiness? Do we have that? Depression and mental illness are at an all-time high in America. So why? I can’t think of an answer. Now I’m not saying that education is bad for you, or that farming is the answer. Neither of those things are true. But what I am saying is this. What if a connection to the Earth and our food is a basic human need, no less than companionship or the feeling of safety? And what if we could fulfill that need in our children with something as simple as a few backyard chickens, or a couple of pots of vegetables on the patio? A window box herb garden? What if we could make the world a better place with something as simple as morning chores? Enjoyed reading parts of your blog posts. Read the post about the birds and your daughter? Have you ever raised turkeys? The have the best personalities, are friendly and are pretty easy keepers. I think your daughter would enjoy them! I hate it when I make typos! Thanks for your comment Jacki! No, we have not raised turkeys yet, but are looking into raising a few Bourbon Reds next year. I think Susan is going to love them too.